Living in a city full of musicians is a little intimidating if you don’t really have any rock’n’roll talent. I was in band in high school (marching tuba, concert contrabass clarinet) and I can play four songs on the ukulele that my husband gave me for my birthday (Sheena is a Punk Rocker, 26 Miles, and You Can’t Always Get What You Want, in case you were curious). Last time I checked, high school marching band wasn’t terribly cool. 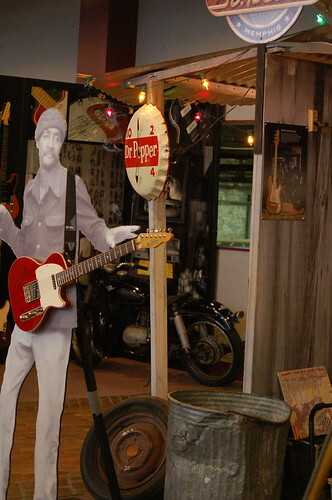 When I stopped into St. Blues Guitar Workshop yesterday afternoon, I felt a little lost. St. Blues started making guitars in 1984. Their first guitar was called the Bluesmaster, a pretty, curvy electric that’s been played by Bono, Eric Clapton, Albert King, and a slew of other big deal guitarists. After a 17 year-long hiatus, St. Blues Guitar Workshop returned to Memphis. 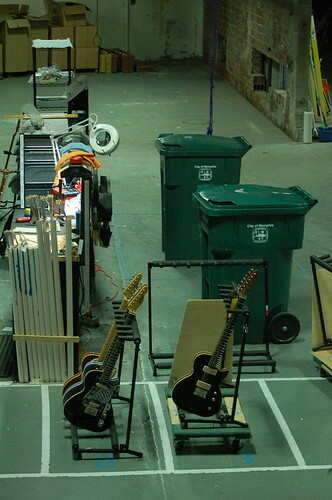 Every guitar from St. Blues is finished and set up in their showroom / workspace on Marshall in Midtown. 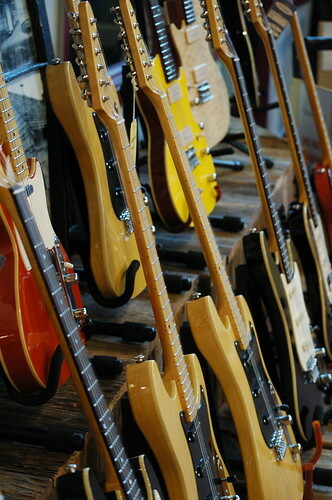 Their completely gorgeous hand-crafted guitars can get expensive. If I could play guitar (and had a bunch of cash), I would totally go for this Bluesmaster. St. Blues has a scratch and dent rack that’s full of near-perfect guitars that have minor issues that don’t affect the quality of the guitar but prevent them from being sold to a dealer. I’m quite partial to that bright yellow one, and the orange one (top left). I hope they go to a good home. Couldn’t agree more. Saint Blues makes phenomenal guitars and does Memphis proud! I researched the st blues mississippi bluesmaster with p90s, listened to the sound from st blue’s site in tenn, and read all the reviews both good and bad(99% good)and purchased one from Adirondack Guitar in Hudson Falls, NY(authorized dealer). They are great to deal with you actually talk to someone, and best prices. This guitar is a great investment both to learn on and its value will only increase once everyone finds out how well they are made and sound!!! !